A character for Don't Starve Together! This is my first character! Hope you like it! This character isn't 100% done, the things I do want to make will be covered on my to-do list in the description. *more dialogue lines (I inserted a few lines for trees and other things but Wilson's dialogue is the basis for most of it. *I am pretty sure this will not conflict with any other mods but if there are I'll try to see what I can do! so no normal DS ? I'm not ready to fully rule out normal DS. I haven't looked into what it takes to port from DS to DST but I'll try. I'll put that on my list of priorities but I want to try to get the other stuff done first. But thanks for your input! This looks awesome, but if you make it so he can be upgraded with living wood, it would make him basically WX-78. 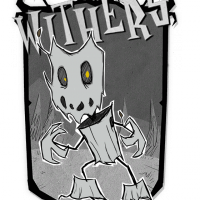 One day we will have a weird but cool tree monster as a character in base dont starve maybe even RoG. But for now randall23 and all the other people will have to wait, along with me.